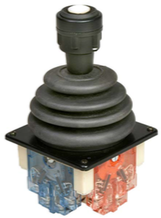 Industrial Joystick, design and sales. Precision Sales Inc.
Industrial Joysticks. Lab grade, heavy duty, mill duty, weather proof. For proportional and step control. Potentiometer, 4-20mA, Hall Effect, Switches outputs. Many handle options. 4" Height above the panel - many 2 axis output configurations. 4.5" Height above the panel - heavy duty reliable. Additional Models & options available. Contact us with your requirement.